Last month, I traveled to Singapore to visit some good friends I knew from my days in Amsterdam. My friend Karla and I spent the day on Sentosa Island, which is a little island just off the southern coast of Singapore with lots of beaches, resorts and attractions. 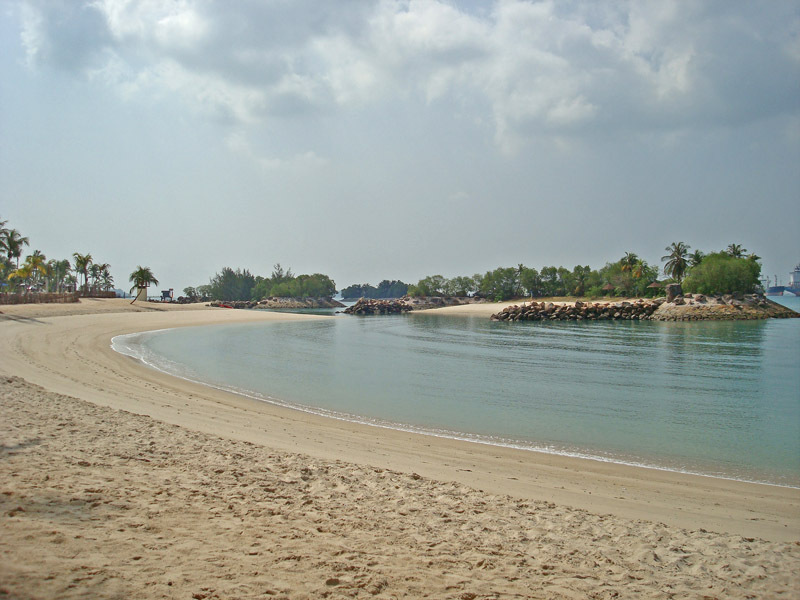 We started our morning on Siloso Beach (pictured in the top photo), just hanging out in the shade of a palm tree. We went for a swim later but were shocked to find ourselves surrounded by small jellyfish. After a fast exit and a talk with the lifeguard, who assured us that the jellyfish were harmless, we tentatively got back in the water. We only lasted about 5 more minutes, before we got out for good. While the jellyfish may have been harmless, they were everywhere, and it was really disconcerting. 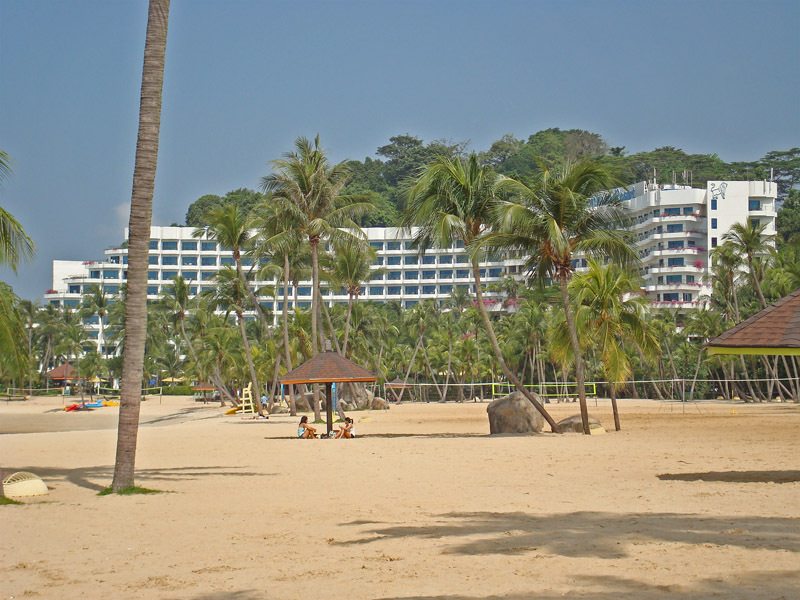 The beach itself was lovely, and we were really close to the Shangri-La’s Rasa Sentosa Resort, a beautiful luxury resort (pictured in the two photos above) that was quite different from the Shangri-La restaurant I grew up near on Point Peninsula, New York. (Despite the vast differences, the NY restaurant is still my favorite Shangri-La!) The view of the South China Sea was nice, although it definitely reminded me that I was near one of the world’s biggest ports. You can see one of the many ships we saw off the coast in the photo below. We ended the day by going to some of the parks and attractions near Siloso Beach, including a trip up the Tiger Sky Tower to get a great view the island and much of Singapore. I’ll post some more of those photos in the next few days. 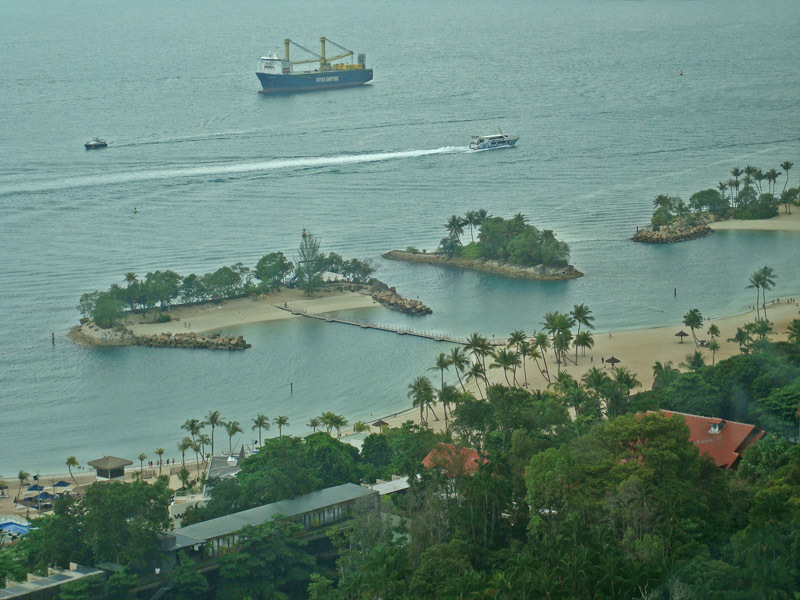 I took these photos from Silosa Beach and from the Tiger Sky Tower on Sentosa Island in Singapore in February 2010. 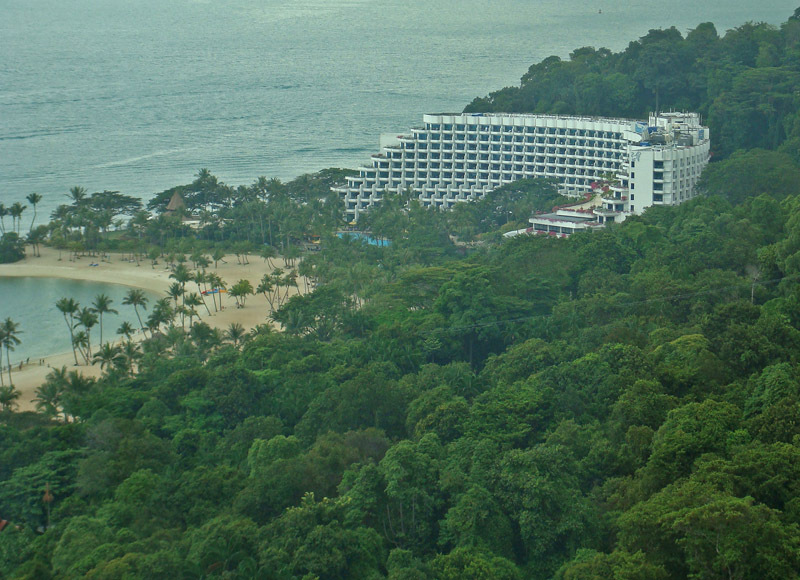 13 Mar This entry was written by Kathy Keating, posted on March 13, 2010 at 4:13 pm, filed under Asia and tagged beaches, kathy keating, rasa sentosa resort, sentosa island, shangri-la, siloso beach, singapore, water. Bookmark the permalink. Follow any comments here with the RSS feed for this post. Both comments and trackbacks are currently closed.